This procedure to remove excess skin and puffy bags can take years off the way you look and improve your eyesight. Heredity as well as the aging process, will contribute to a heavy lid that can send the wrong message, causing an angry or fatigued appearance. Eyelid surgery can reduce the amount of skin wrinkling and fat deposits that create puffiness. 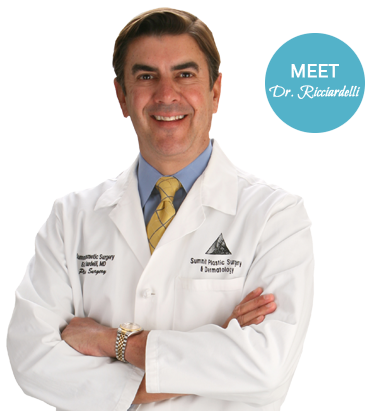 Dr. Ricciardelli has over 25 years of surgical eye experience and keenly aware of what is crucial when operating on men. “It’s important not to reduce the skin too much when doing a blepharoplasty on a man. It can make the eye look feminine. Men having this surgery want to look distinguished.” says Dr. Ricciardelli. There is no substitution for experience and understanding what men want when you are considering male facial surgery. If you are bothered by a tired appearance and heavy eyelids that decrease your peripheral vision you may benefit from having a blepharoplasty. Eyelid surgery may improve your field of vision, renew your confidence professionally, and give you a less tired appearance. Yes. This surgery is often combined with a necklift, facelift, liposuction in the abdomen or flanks, male breast reduction, rhinoplasty and other minor procedures such as laser, botox, and fillers. Take advantage lower pricing and time spent away from work by combining procedures. Ask Dr. Ricciardelli about other procedures during your consultation. At your consultation, Dr. Ricciardelli will examine your eyes to determine what will give you the results that you desire. More than likely you will need a visual fields test from your doctor if you want your medical insurance to consider coverage for this procedure. (See insurance coverage for upper blepharoplasty – Bonnie need section reminder) Dr. Ricciardelli will discuss how the incision on the upper lid falls along the natural crease and is virtually undetectable. Excess fat is removed and the muscle can be tightened if necessary. In most cases, an incision is made inside the lower eyelid to remove the fat that creates puffiness. Tightening of the lower eyelid skin is often done with a resurfacing laser instead of removing the skin. Also you may be a candidate for a canthopexy if you are experiencing tearing or “watery” eyes. Dr. Ricciardelli will help you determine what procedure/s will be best for your skin type, sagging, and lifestyle. Dr. Ricciardelli makes every effort to make the smallest incision possible while giving you the result you desire. Your privacy and safety are very important to us. On the day of your surgery you will park in a designated, convenience space in back of the Summit building close to the private back door entrance of our office. Your surgery will most likely be performed in our AAASF (Association for Accreditation of Ambulatory Surgery Facilities) certified operating suite. Your eyelid surgery may take a half hour up to one hour depending on the procedure. . After the procedure, you will wake up in our warm and caring recovery suite. Our recovery nurse will make sure that you are comfortable and inform your designated driver when you are ready to return to the comfort of your own home that day. You will be given detailed instructions for your specific needs. Most patients do not complain of pain after surgery but a mild discomfort. On average, most patients are able to return to work in 1-5 days and begin light exercising in 2 weeks. A lot will depend on your level of activity at work. After having eye surgery, it is important that you rest your eyes. You will most likely “feel” good but staying on a computer or watching television can extend your swelling. You will be seen back in the office (when?) after surgery. Expect to have possible bruising, swelling and tenderness of the breasts after surgery. Dr. Ricciardelli will call you in the evening to check-in on your progress as well as see you back in the office for your post-operative visits. Our door is always open for any questions.